One of our team dinners was at Holsteins Shakes and Bun at the Cosmopolitan, another behemoth hotel-casino next door to the Aria. You approach Holsteins from a mall and on their floor were other stores and eateries. One of them was Milk Bar. 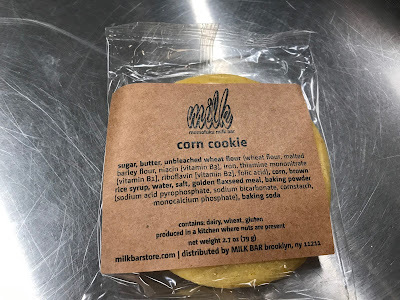 I’d never gone to a real Milk Bar but I have their recipe book and I’d tried the corn cookie via their mix from Williams Sonoma. I was a little early at the meeting spot (and my coworkers were a little late) so I had time to line up and buy a corn cookie from the outer Milk Bar stand. I know I’d had them from the mix but I wanted to see how the real thing tasted straight from a Milk Bar location. We were about to have dinner and I’d just eaten the AlmondBrioche from Jean Philippe almost 2 hours before so I tucked the corn cookie away for later (side note: it was good but I think I prefer making it from the Milk Bar mix) and joined the rest of the team for dinner. As you can surmise from the name, Holsteins is a burger place. It was fairly large and we had the back room entirely for our group. They accommodated us with a price fixe menu that was a subset of their regular menu. Our event coordinator had ordered the appetizers ahead of time but we each selected our entrees. I have a love/hate relationship with burger joints. I love burgers. But since I’m a very plain eater, I hate all the extra stuff that burger places put on their various burger offerings. Seriously, I’m just all about the burger, bun, maybe cheese and when I’m really letting my hair down, a leaf of lettuce. No condiments, no tomato, no onion, no mushrooms, no pickles; don’t touch my burger with that stuff. Holsteins wasn’t exactly a plain burger kind of place so I settled for the plainest burger I could find, the Nom Nom Burger, but hold the dressing. A normal person who would order the Nom Nom Burger would get a burger, cheese, potato chips (on the burger) and dressing. Dressing. Ugh. Why do that to a burger? So I had them hold the dressing and ended up with, as my coworker sitting next to me helpfully pointed out, “a cheeseburger with potato chips”. Why, yes. And that’s fine with me. I will admit it’s a little odd to bite into a nice, juicy cheeseburger and crunch into chips under the bun. I’m sure it was Holsteins’ way of not being a typical burger place. There were a lot more exotic combinations than my cheeseburger-with-chips. But that was fine because it was a good burger. They made even more excellent milkshakes. I rarely have milkshakes – I love them but I don’t love the calories so they’re a sometimes-treat, not an everyday thing. But I’m not in Vegas every day so…. 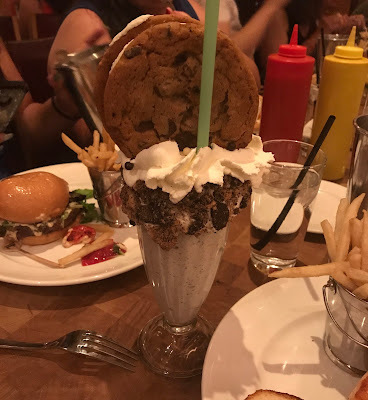 Someone ordered a cookies and cream milkshake and holy cow (bad pun intended), when Holsteins does a cookies and cream milkshake, they really mean COOKIES and (ice) cream. The milkshake came with a jumbo-sized ice cream cookie sandwich on top of the milkshake. My eyes ate it up but I was happy to stick with my regular milkshake. I was full enough. Overall thumbs up for Holsteins – friendly atmosphere, good burgers, fabulous milkshakes.